Would you be kind enough to Lend a Paw to shelter pets? 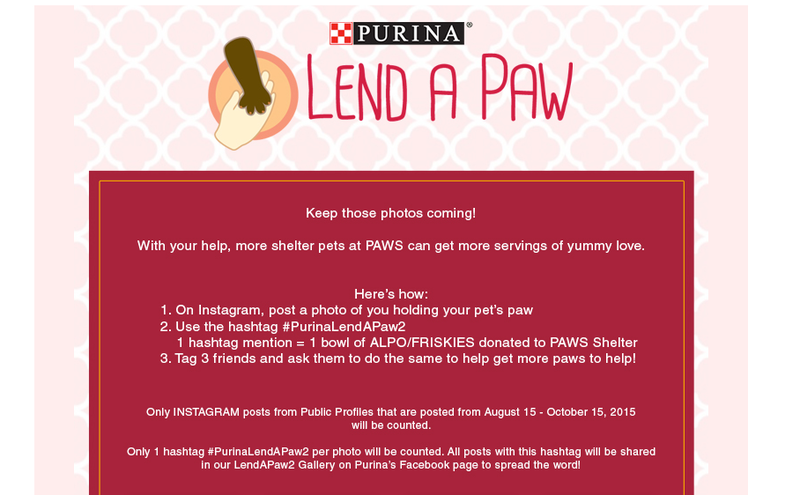 Pet lovers are invited to join and support the "Lend A Paw" campaign of Purina and Alpo for the benefit of the shelter cats and dogs of the Philippine Animal Welfare Society (PAWS.) You do not need to worry about having to shell out any cash as a donation but A picture of you and your pet can help change the lives of these shelter pets. All you need to do is post a photo on Instagram of you and your pet/s holding hands, using the hashtag #PurinaLendAPaw2 and tagging 3 friends to do the same. Every valid post will then be matched by Purina with a bowl of ALPO or FRISKIES that will be donated to PAWS. This is open to all pet lovers in the Philippines,18 years old and above. All photo/video entries must be originally taken by the pet owner. Photos/videos must be clear and contain wholesome images. Offensive/obscene photos/videos are not allowed and will be disqualified. Captions must contain wholesome messages. Offensive captions are not allowed and will be disqualified. The promotion is from August 15- October 15, 2015. So, please, please, please support this campaign. I know that we all love to post the pictures of our furbabies online. I am not in any way connected with Alpo/Purina or PAWS but I support this advocacy. I would really appreciate if you can support this too. For more details you may also visit their facebook page. Let me know in the comments section below if you have posted your picture already in instagram. 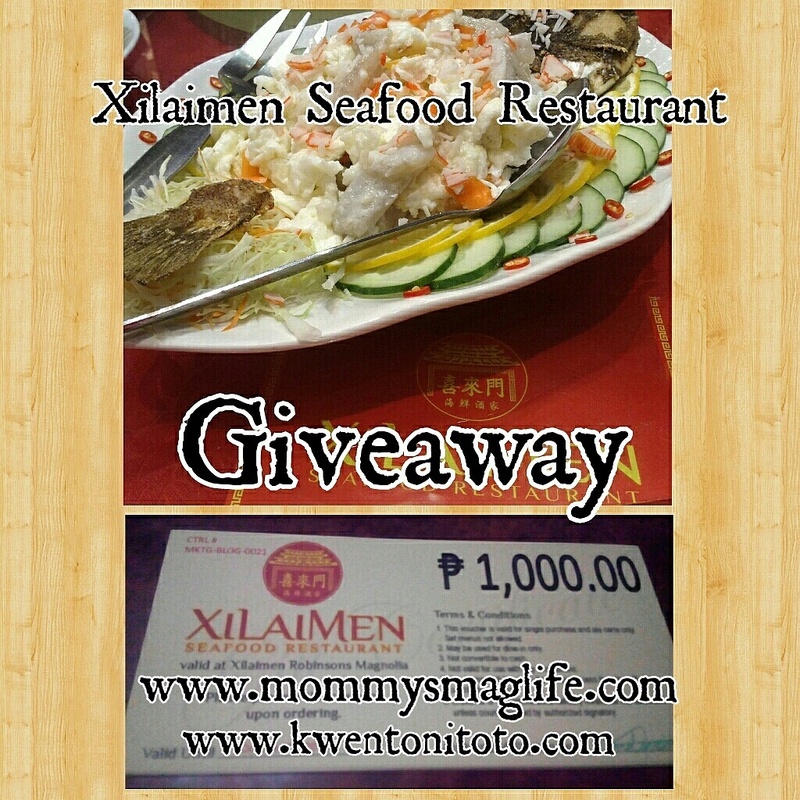 Xilaimen Seafood Restaurant has finally opened in Robinsons Magnolia. They are famous for serving authentic seafood and Chinese cuisine for those craving for an authentic taste. My family is actually very particular whenever we visit a Chinese restaurant because there is really a difference when you get your Chinese food from "so-called chinese restos." According to Andrea Joyce Ng-Wen, “Xilaimen means happiness in Chinese and that is what they want their customers to experience." Their goal is to create an ambiance of joy while serving good food because she believes that a beautiful ambiance is the key for loyal customers to have an exquisite dining experience. Here are some of the dishes that you can enjoy at the restaurant. And a whole lot more. So, go ahead and visit them at the Upper Ground Floor, Al Fresco, Robinsons Magnolia. And here's your chance to win GCs from Xilaimen! 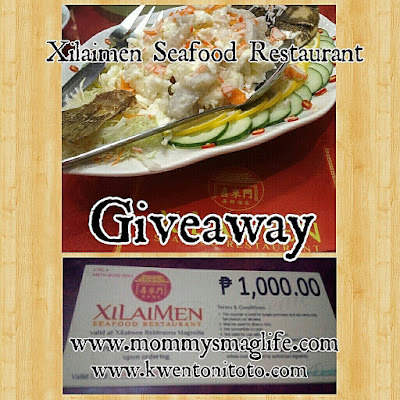 Check out Kwento Ni Toto and Mommy’s MAG Life’s Xilaimen Seafood Restaurant Giveaway on Instagram just follow their account @yashirokuru and @satnomangie and read the details on how to join. Duterte May Run For President, What's Next? 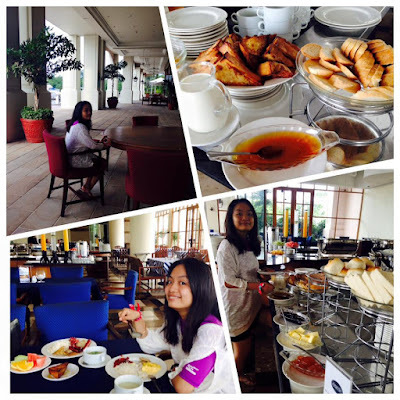 Having a fab, happy and fun lifestyle is not just limited to shopping, food and travelling. In order to have a great life, we must also have a good society governed by honest and strong leaders. As a lifestyle blogger, you might be wondering why an I writing about this. Well, this is just about sharing my thoughts and realizations about the upcoming elections in 2016. I have been a registered voter since 2004 who never really cast an actual vote. Yes, I have my voter's ID but come election day, I don't find the reason to go the precinct, fall in line and endure the heat just to fill up a ballot. It is not that I do not care at all but honestly, I haven't found a leader worth supporting. I found no leader worthy enough for my time, to make me fall in line and endure the heat while I can just simply enjoy the day off at home. I just felt that whoever gets elected will just give us the same results. Now, I realized that if I keep on doing the same things I do, then, I'll keep on getting the same results too. We may not be personally qualified to become the leaders of the country but I believe that we can still do something. First off, we don't need to be stuck with the typical "trapos" during elections. A lot of us start to think about election during the election period itself wherein the person that we really want is not part of the candidates and most of the time, we simply end up choosing "the lesser" evil. People say "Siya na lang" because we lack a better option. Definitely, this is something that we should address. Why don't we support the people we need to become leaders of our country even before the filing of candidacy or election period? The persons whom we believe can bring us change. 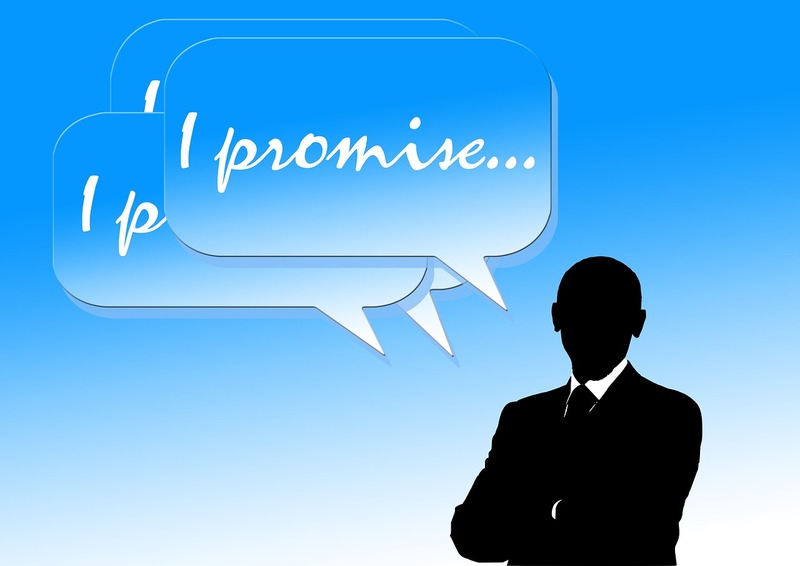 Running for a national office is not easy thus, not everyone is up to file their candidacy without much thought and they may even say "why go through the hassle of it?" However, I believe that if as early as now, we let them know our support and encourage them to do so then we may be able to have the best option and not just any option come election day. If you're asking who am I supporting, it's Mayor Rodrigo Duterte and this is not just because I grew up in Davao. This is not because of the famous Central 911 which I wasn't really able to experience since I moved to Manila in 2010. However, I had personal experiences that made me believe in him and his leadership. As an ordinary citizen, I was able to experience how sincere and honest Mayor Duterte is and his local government. When my grandmother died, I saw Mayor Duterte at the funeral homes. I learned that he was doing this regularly to check on families who lost a loved one and to find out the cause of death. It was part of his assessment on the city's condition. He was not the typical politician who would be giving money or financial assistance with big and bold names with the "pa-epal" effect. Instead, he would check on the status of the family and see what they need. It was not a generalized burial assistance program but rather he takes time to talk to his constituents and go from there. As a NGO worker, I have been lucky to work with the communities of Davao City who were very much supported by the city government. There was one instance that we organized a mass wedding and baptism in a relocation site. Since it was a very big gathering, we asked assistance from the local government if they can help us with the food. On most cases, this is the part where a lot of politicians would love to attend, be considered a VIP and give a speech. However, Mayor Duterte just simply sent us the help we need, no banners or posters with his name. He just helped his community with no "buts" and "ifs." As a student, I was able to experience how hard life was in Davao when he wasn't elected Mayor in 1998 because of the term limits. 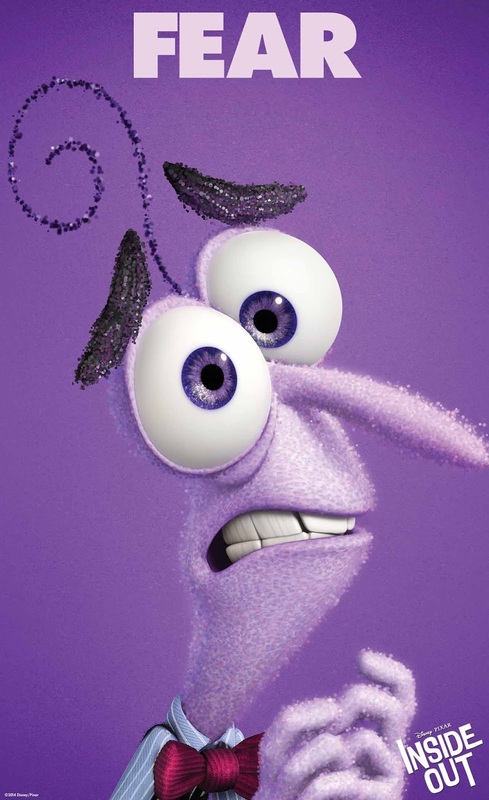 I lost my phone thrice in a year. You may tell me it's stupidity but getting snatched while walking or riding a jeepney is not a normal thing in Davao City. Coincidence? I don't think so. When Mayor Duterte is in-charge, there is a difference. You'll be disciplined and not threatened. Same goes with our parents, if you committed something wrong, then, you'll be scared. At the end of the day, you still respect him and know that he just wants the best for you. That is how he takes care of his city and I am hoping he can do it too for the country if the people will cooperate. So, Is he really running? We still don't have a concrete answer but since the possibility is big then the second thing we need to do is go the COMELEC and make sure we're eligible to vote this 2016. Take note that that comelec registration is until October 31, 2015. How about you? Who are you supporting for President? Share your thoughts. The latest craze involving Eat Bulaga's Kalyeserye entitled "Aldub" is a superb hit. It involved an onscreen love affair between Alden Richards and Maine Mendoza or known as Yaya Dub who never met personally. It gives us "kilig" moments and super funny antics from Wally as Lola Nidora, Paolo as Tinidora and Jose as Frankie. It is no surprise that people whether #TeamBahay or #TeamOffice has changed the way how they spend their lunch break. The TV ratings in terms of audience share has gone really high exceeding historical records. However, there are other signs that they are really taking the nation by storm. 1. Prof. Randy David's review about #Aldub. 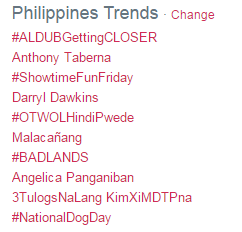 Prof. Randy David is a known journalist and sociologist has talked about #Aldub. With his regular column in the Philippine Daily Inquirer, Prof. Randy David talked about Dubsmash, its uses and Yaya Dub. I have always believed that if Prof. David talks about it then there must be a sociological importance. You may read the full text here. Everyday, the #Aldub phenomenon never fails to become the top trending post in twitter for the Philippines and today, it ranks second worldwide. (as of writing) With millions of tweets, it is enough proof to say people are really talking about it online. 3. The Church approves it. The Catholic Bishop Conference of the Philippines lauds and 100% approves the #AlDub kalyeserye for upholding marriage moral standards. They have shown their approval via sending a number of posts in twitter. 4. 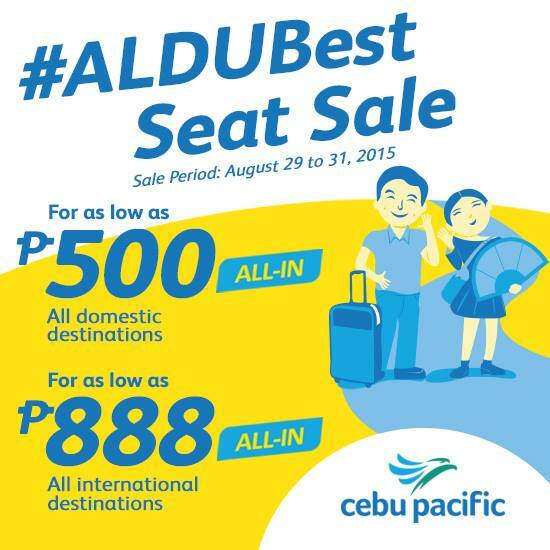 Lastly, Cebu Pacific creates a seat sale entitled "AlduBest Seat Sale"
This actually made me smile knowing that private corporations are also taken by the #AlDub phenomenon. This promotion will start midnight of August 29. All Domestic Destinations are available for as low as Php 500 ALL IN. and all international destinations for as low as Php 888 ALL IN. How about you? Are you also part of the #Aldub phenomenon? Share your thoughts. 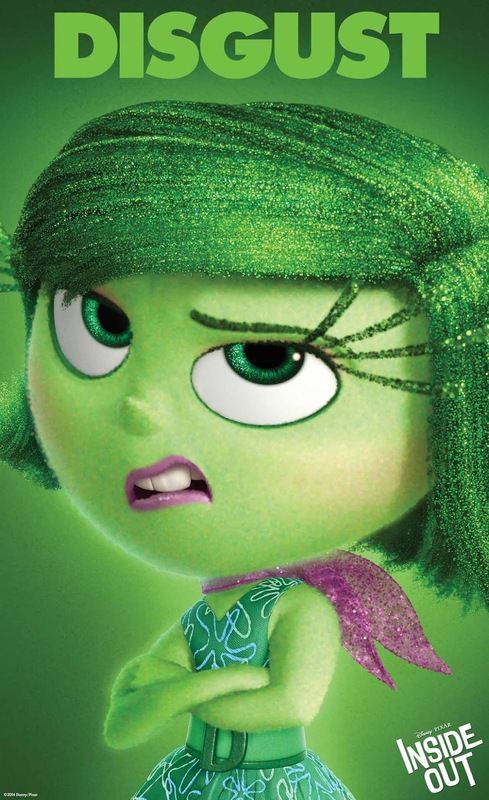 Finding our perfect home involved different emotions INSIDE OUT! Relocating to a new place and finding our perfect home in Bacolod brought Val and me different emotions. 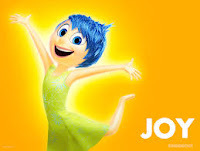 There was JOY and excitement for a new adventure. I was thrilled about getting our perfect home and ecstatic to start decorating. A new neighborhood to meet new friends and a lot of places to explore. Though we were able to visit this city a couple of times, there are so much things we are looking forward to. However, moving away also brought us SADNESS. It means that we're going to miss our old house, our friends and family. I am going to miss the events in Metro Manila, our favorite restaurants, food and stores. There was also FEAR that what if we can't find our perfect home. We were also scared that maybe it was not a right decision to relocate. What if life is going to be difficult and opportunities would be so few. There was FEAR of the unknown and the possibilities that might happen. Regardless of the mixed emotions, we are bound to make the decision. First, we need to look for a house where we could stay. Initially, we relied on buy and sell groups in facebook. Unfortunately, this brought me DISGUST. Some sellers are so unprofessional, they don't reply nor provide information about the property. We kept on waiting and realized we were just wasting our time. I was so angry that I realized that we need more options. We need to get in touch with different sellers and check out their properties as soon as possible because we are just left a few weeks before the move. And Thank God, I found about Property24. It is the fastest growing property portal in the Philippines and it was very helpful in finding our #PerfectHome. Now, let me share to you some of the properties we saw. Other things I like about Property 24 is capability to filter minimum and maximum prices. This makes the search faster because you can directly work with your budget and you can also Apply for Home Finance where they can assist you in home financing and you can just send out an inquiry through the website. So, can you guess which property we got? Are you also looking for your perfect home? Vikings Bags Awards at WOFEX 2015 and Guess Where is Their Next Branch? I have always believed that behind every delicious dish is an excellent cook. With my favorite buffet restaurant that offers widest selection of sumptuous cuisine then there must more an just an excellent cook. Vikings Group Chefs Jonathan Jota, Anton Abad, Mark Wilhelm Ragudos, Jennifer Gumboc, Don Aries Jerome Duenas, Joel Mondelo, Mark Reyes, Charles Andrei Santos and Raphael De Jesus won top honors for the country and their restaurants Vikings, Niu by Vikings and Four Seasons Hotpot City. Yes, award winning chefs are behind the incredible feast we enjoy whenever we visit. The chefs spent four days battling the best of the best at the Philippine Culinary Cup (PCC) of the World Food Expo 2015 (WOFEX) which is the only World Association of Chef’s Society (WACS) endorsed competition in the country. This competition is an avenue for Filipino chefs to gauge their skills against chefs from other countries, and gain international recognition for their culinary expertise. They received a total of 13 medals across different categories. Chef Jonathan Jota won a gold medal for the Quick Fire Salad Category, winning Silver Medal is Chef Anton Abad for the US Beef category, Chef Mark Wilhelm Ragudos for the US Poultry category and Chef Don Aries Jerome Duenas for the Creative Breakfast Challenge category. According to Over-all Coach Chef Jonathan Jota, "The Vikings Team placed 3rd on overall performance for the Professional Category at the PCC 2015, beating international competitors from Korea, Malaysia, Hong Kong and other Local Hotels and De Luxe Restaurants." Vikings is one of the places I truly miss in Metro Manila because they have always been a part of our special occasions. But can you guess where is their next branch? Yes, they will be opening a branch here in SM Bacolod. Yipee! Tentative opening date is sometime in September. I am just so excited and definitely, we know where to celebrate the coming birthday of Val. Bacolod Blog Series: You've never been to Bacolod if you've never been here! I have always believed that every place has one iconic spot that almost all tourists visit. One where you should take the "mandatory" shots. 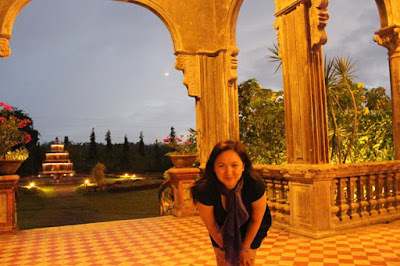 Places such as Merlion Monument in Singapore, Chocolate Hills in Bohol, Magellan's Cross in Cebu and The Ruins for Bacolod. 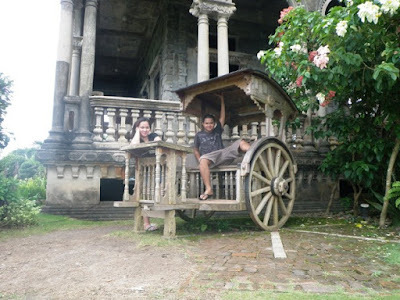 The Ruins in Bacolod was a mansion built in the early 1900s by the Lacson family, one of the famous clans in the sugar industry here in Negros Occidental. The largest structure in the area that has a beautifully landscaped garden and a 4-tier fountain that added to its majestic view. For more than 100 years, this structure in a 900+ sq meter property still stands firm and provides a picture perfect background to all visitors. 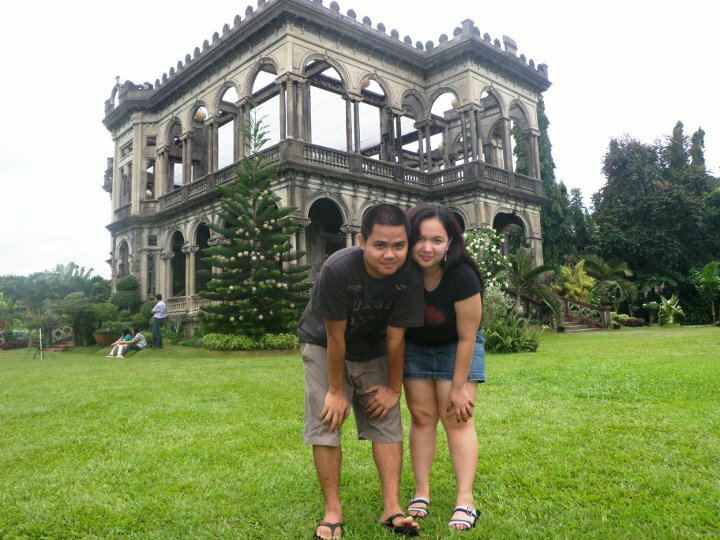 They are also one of the favorite venues for a prenuptial shoots. Aside from taking pictures and enjoying its rich history, one can also relax and have coffee in their Mediterranean cafe. TIP: The best time to visit is actually around 5pm or early in the evening when the lights have been lit up. 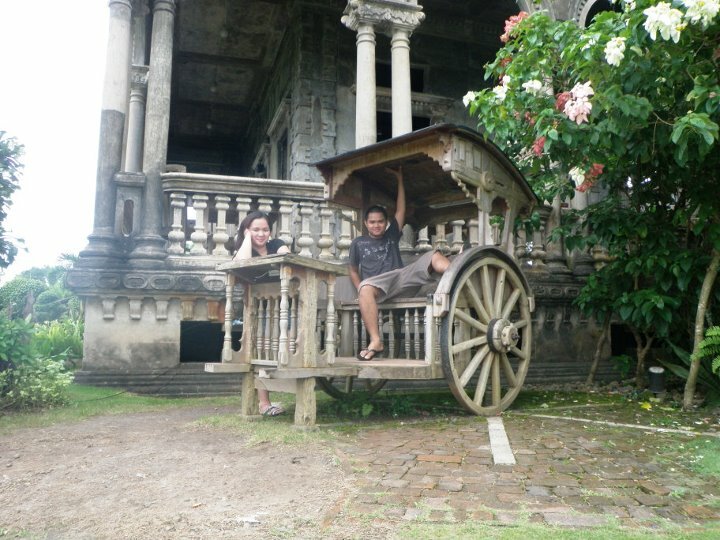 So, whenever you visit Bacolod, make sure to drop by at The Ruins. The roads are already cemented and it is very accessible even if you don't have private transportation. There are tricycles at Brgy. Bata that can bring you there. Entrance starts at Php 40 for students and senior citizens and it Php 95 for adults. Subic is one of the easy escapes from the busy and crowded Metro Manila. It approximately takes a 3 hour drive via NLEX. Whenever we hear about Subic, we immediately think of Ocean Adventure and Zoobic Safari as our primary destinations. Definitely, those two should be part of your itinerary however, I would highly suggest that you also experience the Subic Bay Yacht Club. 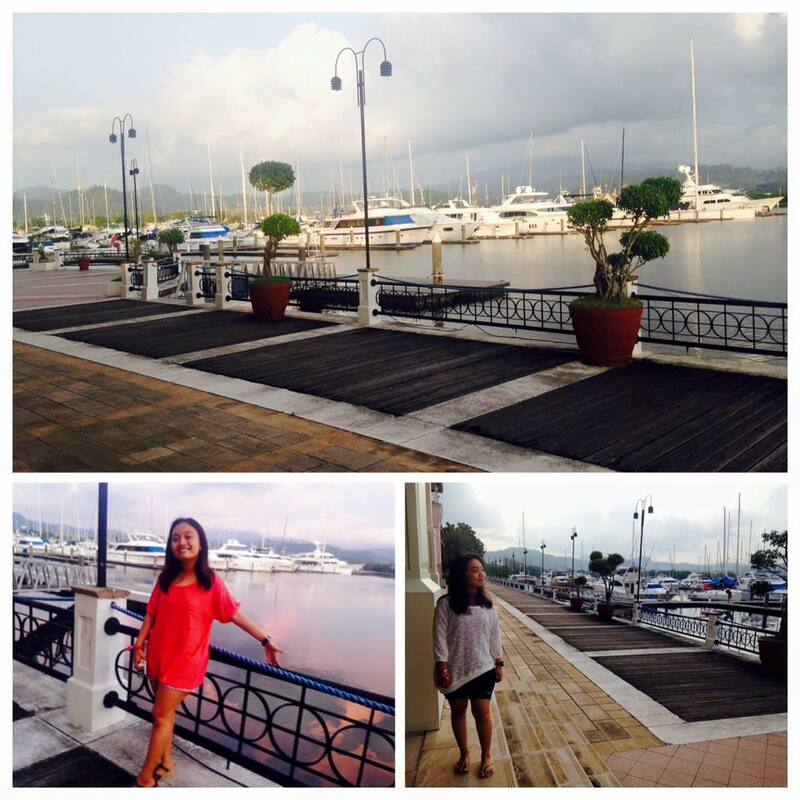 Subic Bay Yacht Club is all about experiencing the good life. A luxurious and elite experience that even if we don't get to do it everyday, it would definitely be a memorable once-in-a-lifetime experience. For years, this place was a membership only facility which means that it was exclusive to those who have the 6 digits for the fee. The luxury and exceptional experience were only limited to those with fortunes. However, today, the premiere marina is extending their membership to non members to feel, enjoy, eat and have the a great experience at the club. It is located North West of Manila and is set with Zambales Mountain range on the Eastern part and the tranquil Subic Bay that opens to the South China Sea on the west. A perfect paradise with safe harbors and pristine flat waters. A vacation destination with elegant design. An exquisite service and warm hospitality. 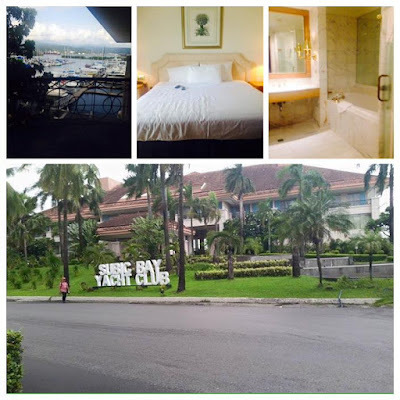 In the hustle and bustle of city life, whether you're from Manila or in any parts of the world, Subic Bay Yacht Club offers the million dollar view of the bay and surrounded by mountains. We love to escape stress and just to look at the pristine and relaxing view gave us that moment that we all need, the feeling of rejuvenation. The different choices of rooms with the options based on your budget and need. 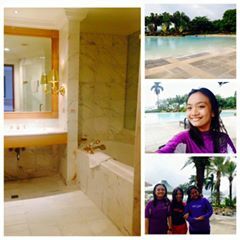 They have rooms for as Php 6,000 per night. They also have a variety of accommodation at Subic Bay Yacht Club. All are spacious and elegantly designed to satisfy the discriminating taste of every member and guest. Each room and suite offers a balcony, with selected suites having a marina vista. The elegantly designed swimming pools are just part of the complete package. Everyone who checked in can use this facility. You can just relax in this place while checking out the different yachts over the bay which is just 20 feet or less away from the pool. All rooms are equipped with a jacuzzi in case you want complete privacy relaxing in our own room. 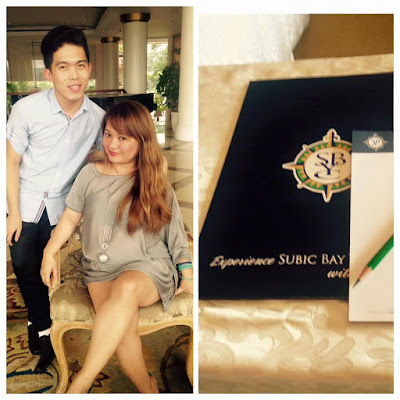 The Subic Bay Yacht Club take pride on superb customer service. You can feel how friendly, professionally trained and naturally accommodating all the personnel from the bell boy to the managers on duty. Bacolod City is now officially our home! After our "epic journey" traveling by land, we have finally settled down. (Hooray!) More details on the road trip, here. Now, our next stop is to explore this place and since Masskara Festival will be celebrated in a few months specifically in October. I have decided to create a blog series featuring our latest discoveries in this beloved city. I love sweets and I'm really crazy for desserts. 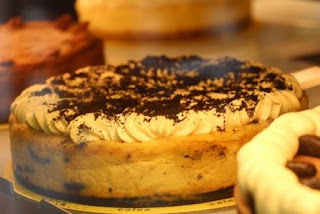 So, my first featured post is all about Calea Pastries and Cakes. Whenever you mention where's the best place to have cakes, locals would immediately mention this place. 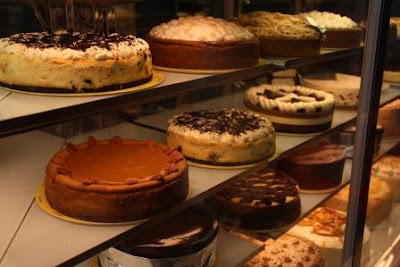 Known as "the home of the country's best cheesecakes", Calea Pastries and Cakes should be on top of your itinerary whenever you visit Bacolod. 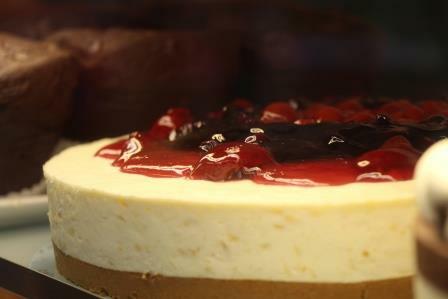 They offer a wide selection of cheesecakes, imported chocolate cakes, refrigerator cakes and muffins which will make you go gaga on what to choose. I won't go over a detailed a review on how they taste like but I'll tell you. Everything is so good. 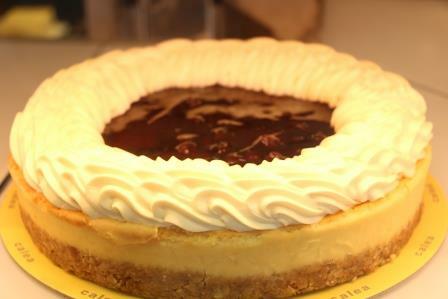 Calea has several branches in the city: Robinson's Place Bacolod, The District/ Ayala Northpoint and the main one at Lacson St near L Fisher Hotel. So, how about you? 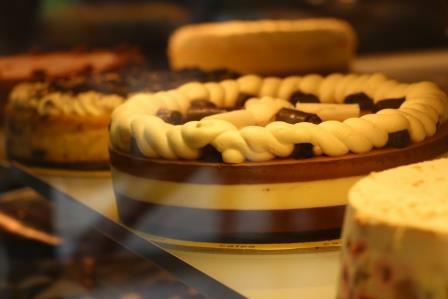 Are you craving for dessert? Share your thoughts in the comments section. Rainy Day: What to Wear? Today is my dad's 67th birthday. We were supposed to go out to celebrate but it was raining really bad due to Typhoon Ineng. The roads are flooded and since we stay at our farm, it's actually very muddy. Despite all of that, I love the rain. I love wearing jackets, sweatshirts and boots to keep me warm. Working in a call center also made me consider jackets, coats and sweatshirts a staple in fashion. There are actually different kinds of coats/jackets ranging from wool to waterproof depending on your preference but I highly suggest that we choose the ones that can be worn on rainy days and even mild weather. We should never forget to bundle up especially during the BER months since our immune system drops when it's too cold. Being sick is not cool. 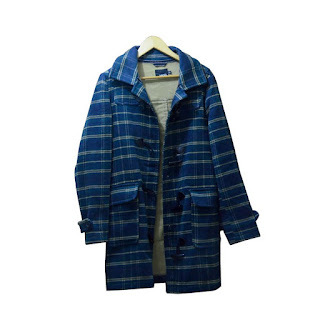 Online shopping communities like eBay, Kaymu, and among others have a wide range of cozy items like coats, jackets, hoodies, boots, thermal leggings, and more. You can also trade in or sell your pre-loved items in these online stores either by their web or mobile platforms. We should keep in mind that even if the weather might not be very good, it's not an excuse to look crappy. So, bring out the fashionista in you and let's start singing in the rain. 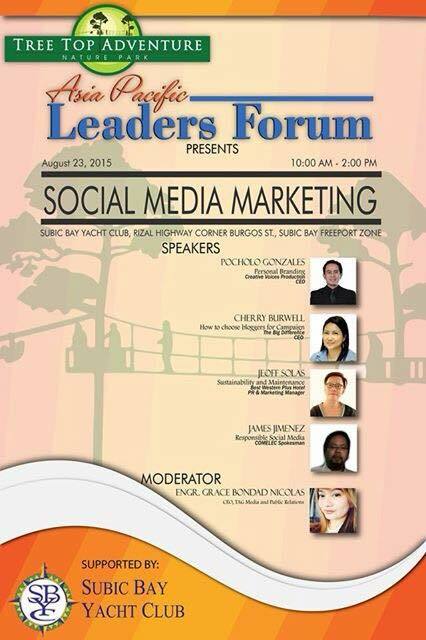 Tree Top Adventure presents "Asia Leaders Forum: Social Media Marketing"
2. How to choose Bloggers for campaigns? 4. How do marketing managers become the brand ambassadors of their own company. 5. How to sustain and maintain the relationship with bloggers? . 6. How to effectively convert likes into sales? We believe that social media marketing is very important and leaders should consider its relevance in business growth. Participants would be able to understand what social media marketing is really all about and the ins and outs of social media for businesses. This event is organized by TAG Media and Public Relations. For more information you may contact 09166299381 or email your inquiry to maria@asiaecommerce.ph. Don't forge to visit their website, http://www.asiaecommerce.ph for other events in pursuing excellence. Are you a fan of "The Millionaire's Game" or the "Monopoly"? Did you have fun playing board games when you were younger? Have you been worried that you lost the dice because someone threw it really hard and the game can't continue? Do you dislike cleaning up or sorting the paper money after playing the game? If you said yes to it, then, you will love the newest online game, Just Roll it brought to you by the Game Club Philippines. Be a character of your choice, travel the world and build a real estate empire by purchasing properties. 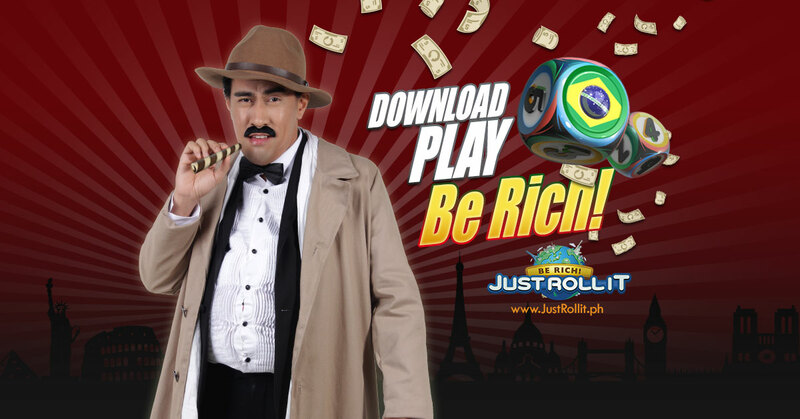 Collect rent from other players who get to land or visit your property and #justrollit. The main objective of the game is to grow your empire, get all the money of the other players until they go "BANKRUPT." Technically, the game is somewhat familiar like the similar board games I have mentioned earlier however, what makes it unique are character's special abilities to manipulate the dice, by being equipped with lucky charms and using the special dice. It's an online game which means that you can play with your friends and distance wouldn't be an issue. No need to be worried about missing the dice or even cleaning up after the game. Cool right? The game is not all about luck by #JustRollit but it involves strategy and a great deal of decision making. I am pretty sure you'll get hooked to it once you start playing but you don't even have to worry that you'll be wasting your time. Players have the opportunity to win real money. For a limited time offer, there are actually daily, weekly and monthly draws. To join the daily raffle, players should get a DAILY CASH PRIZE TICKET by simply playing the PLAY MORE, WIN MORE SYSTEM and get the chance to win Php 1,000. To join the monthly raffle, players can gain one entry per day for every 5 games played. They can also gain raffle entries via the PLAY MORE, WIN MORE SYSTEM and winning a match.and get the chance to win Php 200,000 cash or the latest Samsung Galaxy S6. You may visit their website at http://justrollit.ph/ for more details. Be part of the community by joining the forums. So, what are you waiting for? Download the app now and start playing. My dad is turning 67 tomorrow and who says 67 is too old for a new adventure? Definitely, Not Enervon Prime! Unilab's adult nutritional drink that has protein and other essential nutrients, Enervon Prime has a very exciting promo for all adults age 50 and up to have the chance to travel with two friends or family members to a domestic or international destination—for free! Joining is easy: you only need to buy P500 worth of Unilab’s Enervon Prime adult milk variants, upload the proof of purchase, choose from the list of destinations, and share a video why you like to travel to your chosen destination. You can log on to www.enervonprime.com to register and send your entry. You can also find in the website the list of supermarkets where the Enervon Prime Seniors on Tour video booths are set up so you can submit your entry. Promo runs from August 15 to October 15, 2015. For more information, visit www.enervonprime.com. 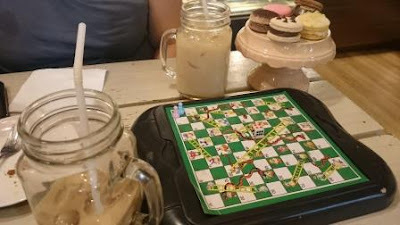 Val and I were in Tomas Morato area and decided to look for a place to hangout while waiting for our dinner appointment. Since traffic was bad, we decided to just find a place near the vicinity. A cozy place caught my attention and we decided to check out Mrs. Graham's. And guess what? I immediately fell in love with it. 1. 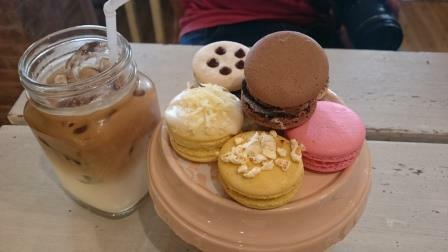 They offer the best french macaron in town. Not to mention they have a lot of flavors to choose from. My faves are the salted caramel and ensaymada. 2. 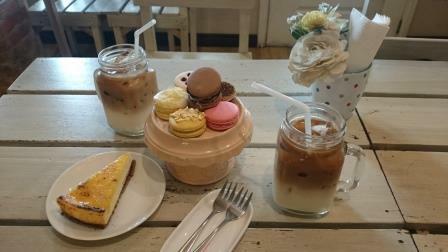 Aside from macarons, they also offer cakes and coffee. 3. They offer board games that you can enjoy for free. Val and I spent the afternoon playing "Snakes and Ladders" which I believe is a great change. 4. They have free wifi. I guess all establishments should offer that now. 5. Lastly, they have awesome decorations. They provide the perfect ambiance for hanging out with friends. The place is not crowded which I really love. I highly suggest that you plan your next hangout session with the girls at Mrs. Graham. 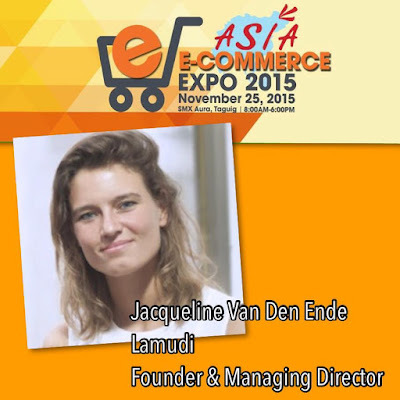 The Asia E Commerce Expo 2015 is scheduled on November 25, 2015 at the SMX Aura, Taguig, Philippines wherein it will be participated by over 15 local and international high level speakers and more than thirty event sponsors. It will also be a good venue to network since it will include an hour speed networking. Among the high level participants is Lamudi Philippines. It is the leading online real estate website in the Philippines with over 90,000 properties and 1,000 brokers and developers online aiming to help consumers find their perfect home with a click of a button while helping brokers and developers expand their market reach. Lamudi is globally established in 30 countries and is part of the Rocket Internet Group of companies, the largest incubator of online start ups in the world with headquarters in Berlin and over 100 ventures across 50+ countries. Same company behind Zalora, Lazada, Zalando and Groupon. Lamudi Philippines acquired MyProperty.ph in April 2015. Jacqueline Van Den Ende, the founder and managing director of Lamudi will join Cinstantin Robertz of Zalora and Janette Toral of Digital Club Filipino in the first panel discussion during the expo. Asia E- Commerce Expo 2015 (#AECoE) is brought to you by TAG Media and Public Relations. This is definitely a once-in-a-lifetime event to learn from and network with the brightest leaders and award winning experts from emerging markets. The best place to find networking opportunities and learn about digital marketing, CRM, strategy, e-commerce. So, reserve the date and see you at #AECoE. For partnership/sponsorship inquiries, please contact the organizer at 09166299381 or email at maria@asiaecommerce.ph. Registration Fee is Php 3,000/ head inclusive of snacks, elegant lunch, speed networking and entrance to the expo. SCAM FREE: Get paid by answering surveys online. Why should you switch to ORGANIC BABY WIPES? 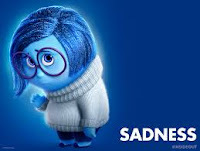 Are you sick and unhappy? Read this. 2019 My Metro Lifestyle. Ethereal theme. Powered by Blogger.